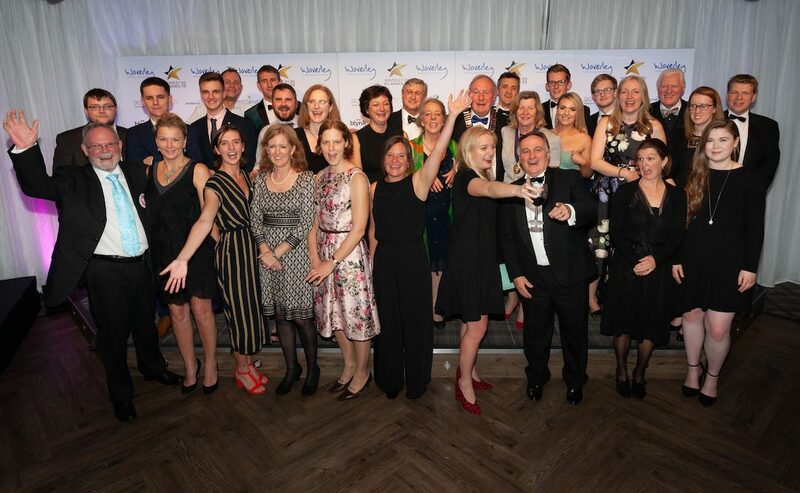 Almost 200 people from across Waverley, including 30 from Haslemere got together on Friday evening to celebrate the best of Waverley organisations at the BIG Awards Ceremony. We were treat to a wonderful setting and dinner at The Lythe Hill Hotel decorated with magnificent floral arrays on each table from Marley Flowers. Our guests included a contingent from our principal sponsor, Waverley Borough Council, including Denise Le Gal (Waverley’s Mayor), Julia Potts (Council Leader), Jim Edwards (Economic Development Portfolio Holder, and Catherine Knight (who has been Waverley’s point person on the BIG Awards). We were delighted that the Mayors of the four towns joined us including our own David Round. Craig McGowan’s comments on the Awards “Dylan’s were worthy winners in view of their track record over the years of innovation, community engagement and staff empowerment. It has capped a great year for them, especially after their recent TV performance and the expansion plans they are about to put into effect. Community Partnership was awarded to Branston Adams Accountants narrowly ahead ofBakerLaw LLP and Marley Flowers. This was our first initiative working together as the four Waverley Chambers with Waverley Borough Council. Our next joint initiative is the proposal for a Business Improvement District. Lets work together to make this an equivalent success. Photos of the evening can be viewed and download here. All photos are courtesy of Remarkable Studio.